Discussing range of motion. Demonstrating issues with small of the back carry. How TV influences perception. 1950’s, Dirty Harry, Miami Vice, and more modern shows like NYPD and Law & Order, NCIS. Issues of realism and reality. Characters placing holsters too far forward with forward cants. Paddle holsters through belts. Other outside influences. Friends and co-workers, what works for them does not necessarily work for you. Opinionated sales people. Web & blogs. List of names of good sources of information. Sight lines. Avoid breaking them and printing (outline of gun). If you change your gun, your holster, clothes, or even your vehicle – than you need to re-evaluate your equipment and training. Activity – what are you going to be doing often defines your clothes and your carry. So does the climate. Often the more deeply and harder concealed the harder it is to draw and engage the weapon. Other issues: gender, range of motion, injuries, weight, age, fitness. Cannot “train away”, must work around. Most of the time you will be the “responder” and not the initiator. Always behind the curve as a responder. Must have a mindset. Practice. Practice. Practice. Develop the skills ahead of time. You have to WANT to survive. Came across a boot with a new holster design. It’s actually a clip holster that has a short rod that inserts into the barrel. It felt sturdy. Was reversible for right or left carry. My only concern is protection of the trigger. The trigger is protected on the clip side. It probably unlikely rolls of belly fat are going to manipulate the trigger, so my concerns are probably overblown. I give it credit for Wong innovative and adaptable. I once purchased a holster for my GP100. It has the full barrel shroud and a thicker barrel than the average 6″ revolver. As such, I had difficulty finding suitable holsters that did not bust the piggy bank. One day I purchased a used leather holster out of a “bargain box”. I was told it was a good fit, but voiced my concern regarding the trigger not being fully covered. My concerns were dismissed. 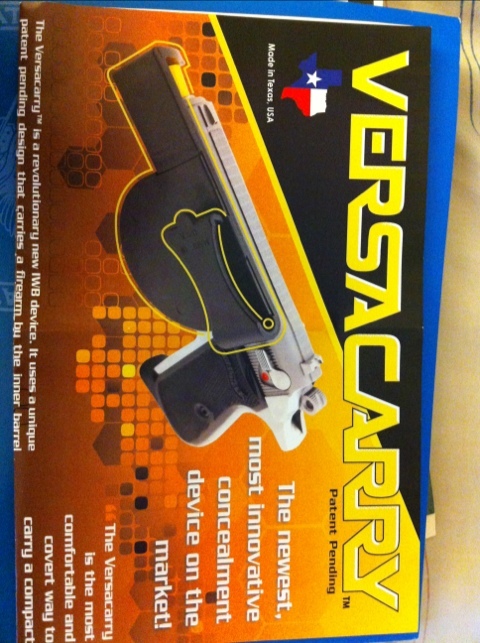 I’ve never used the holster, while a double-action trigger pull may in fact be sufficient a defense in many situations. I am personally uncomfortable with an exposed trigger. Why? coverage – the trigger must be covered and not exposed to external sources. Apparently, I am not alone in my opinion that a holster that does not protect the trigger is inadequate for carry purposes. While I am sure some would disagree with me. Heck, there are people out there who’ve been Mexican carrying firearms for longer than I’ve owned a gun; I am still of the opinion that it is a needless risk to safety. The less we chance to Uncle Murphy the better. This was a 2 day course building upon the prior NRA Pistol courses I have taken. 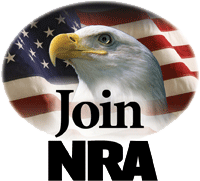 (NRA FIRST Steps Pistol, NRA Basic Pistol, NRA Personal Protection in the Home). We went over the states of awareness. Though many are probably more familiar with the four colored system of “White, Yellow, Orange & Red”. While it can be broken down further the basics of the draw entail 4 steps (5 is you’re wearing covering). First was gripping the pistol with our strong hand while ensuring our weak hand was to our chest safely out of harm’s way (or at least any harm of our own doing). Second was the process of drawing the firearm from the holster and rotating the muzzle out and forward. [This position that a sidearm can be fired from.] Next we bring the pistol to a ready position in front of ourself; it is at this time our weak hand joins our grip on the pistol. The fourth stage being to extend the pistol forward while keeping it level so that you can sight in accurately. We would repeat this same process in reverse in order to re-holster. Helping to reinforce the patterns of movement. Of course, as many states require conceal carry. We also addressed how to handle your external garmet; allowing you to access your firearm. This is really a pre-step, maybe even a side step. Because while it is the first step in drawing, it may not be the last step in re-holstering. As you likely have to move the garment before returning the sidearm to your holster. A couple of advantages to this method is that step 3, the ready-position, can be advantageous to training. Many ranges prohibit or look down upon drawing from a holster and firing. However, by picking up the firearm from the table or bench and bring it to ready position (3) and then extending. You essentially are practicing half your draw and shooting. This combined with dry-fire practice can help reinforce your skills. After all of this (and quite a bit more) we went out on the range for the last hour or two of day one. However, most of the second day was spent on the firing range. The first thing that caught me off guard is that we did not shoot from the partitions. Rather our instructor had us all stand in front of the normal firing line, using an line on the ground as a demarker. This was one of those very odd feelings as even as a fairly new shooter, I have it ingrained in my mind that one does NOT shoot when downrange. But the value in doing so was quite clear. On the street there is no range, and there sure as heck ain’t no partitions to give you a comfort zone to either side. I just had to make the internals of my mind realize that I was not standing in front of the firing line. But rather we had denoted a new firing line. During the two day course we practiced drawing from a holster and firing and returning to a holster. There were three stages in drawing that we were able to present the gun on target. These were the extended position of course. The ready position and the second stage upon drawing and rotating the pistol so the muzzle faced the target. Of course, accuracy was best when we had fully completed our draw. However as a great majority of engagements on the street occur at close range. We were shown how a standard human sized target could still be hit at close ranges from the other potential firing stages. We even did an exercise entailing drawing the pistol and begining to fire at after we’d pulled and pointed the gun. And continuing to fire as we moved to stage 3 “ready stage” and as we extended the firearm until we were in our standard shooting position. Other drills included handling for failures. We interspersed snap caps in our magazines. So that we had random failures which would require that we ran through the tap, rack, assess/shoot drills. We also engaged in practice exercises addressing drawing when we are not directly facing the opponent. When the opponent is standing to your left, your right, or even behind you. We explored the options available and the advantages and disadvantages. From drawing and rotating, to drawing and passing the sidearm to the weak hand which may have easier access to the target. We had practiced how to properly pass a sidearm from one hand to the other and discussed the merits of weak hand shooting. Seeing that use of your weak hand is not limited only to situations in which your strong hand has been injured or immobilized. As we went along, the exercises began to incorporate more and more of what we were learning. Including moving while drawing and firing. And eventually shooting from cover. There were four of us in the class and all found it beneficial. I know a couple of us were really enjoying ourselves by the end of it all. I personally came away with a lot of new found skills. A lot of new knowledge and a boat load of things to practice and drill. Our instructor included a supplemental handout of dry-fire skill building drills which I am very appreciative for. If you carry, or are considering carrying, I strongly advise taking this course. I will throw out the caveat that your mileage may very depending on your instructor. 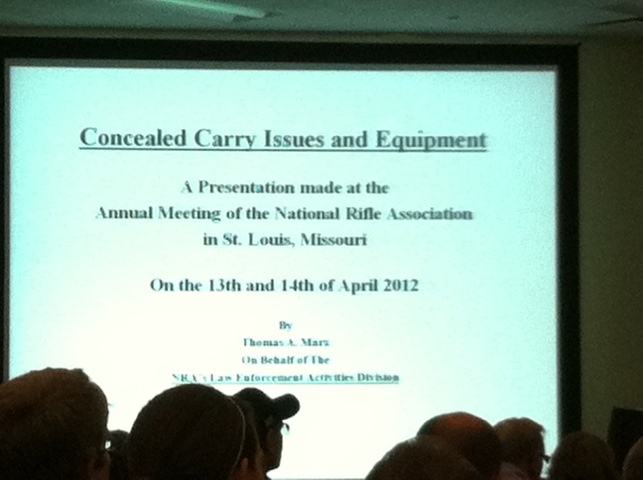 I believe our course while covering the NRA material expanded the scope and depth of material a bit. And I am very glad for this. Just like when I took driver’s ed many years ago. My instructor made the following statement… “I am going to teach what you need to know to pass the test. I am also going to teach you what you need to know to drive and not get yourself killed.” And I’ve always preferred that approach. Why else am I paying for instruction? I can read a book and learn quite well. But I am one who likes to ask questions, interject thoughts, and really understand “Why” I am doing something. Courses that I have taken where the instructor was by the book, often left me with numerous questions. Such instructors are often merely parroting the book. They don’t have enough of an understanding to explain the mechanics or address the unsaid subtleties. An instructor who is at a level where they can expand upon a book, and say “Hey, when is this a good strategy. Is it still a good strategy in situation B? Maybe not, huh?” is always more beneficial to me. Firstly it satisfies my curiousity. Second, it facilitates my delving and self-learning. Lastly, it just gets you thinking and internalizing your understanding of the material. So I am thankful that I have been blessed to have such an instructor for this course. It’s always a joy to learn and have fun. However, I have felt that taking such a course is part of my duty and responsibility as one who carries a firearm. I’ve endeavored to absorb much book knowledge over the past year. I’ve read a number of books by the likes of Massad Ayoob, Jeff Cooper and more. But the advantage of a course like this is put such knowledge in action and turn it from book knowledge into action knowledge. Taking a course such as this helps me to be more confident. By that, I do not mean more confident in my ability in a gunfight. (Albeit that does come into play a bit.) More so, I mean that it makes me more confident in my ability to learn, train, and hone the skills that will enable me to increase the odds that I come out on top were I ever to find myself in such a situation.